Wayshopy Small in size & BIG on quality. This mini monster is named ""Rugby"". Play FM radio and enjoy your favorite music directly through Bluetooth, AUX cable, PEN drive or Micro SD card with rechargeable battery. Ideal companion for iPhone's, Smartphone's, iPad's and Laptop's (gives excellent audio output when you are enjoying your movies in your own comfort). 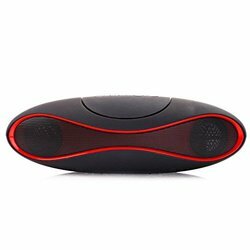 Once connected with mobile phone through Bluetooth, works as an extended speaker phone too. Excellent device for corporate customers where it can be used for conference calls. Can be easily carried in your bag when travelling.